The awards represent a further service excellence milestone for Volga-Dnepr Group in its 25thanniversary year with more top honours for its scheduled cargo and cargo charter airlines. AirBridgeCargo Airlines was voted ‘Best Overall Carrier of the Year’ in the Customer Choice Awards, which attracted 18,000 online votes. Volga-Dnepr Airlines was awarded the ‘Charter Operator of the Year’ trophy in the Industry Choice Awards in which nomineesare judged and ranked by a respected industry panel of 17 judges. 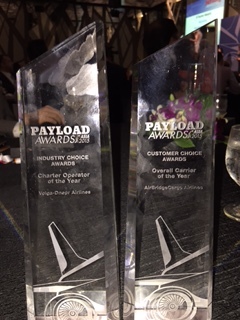 The two airlines received their trophies at a special gala awards ceremony at the Crowne Plaza Changi Airport in Singapore which was attended by more that 250 senior executives from the international air cargo industry. Now in their fourth year, the Payload Asia Awards are a celebration of excellence to highlight the air cargo supply chain companies that have excelled in the industry and made a positive impact on the market. This is not the first time ABC and VDA have been recognized by its customers. In 2014 ABC was presented with the ‘Best All-Cargo Carrier’ prize in the 2014 Asian Freight and Supply Chain Awards. It has also been presented with other global awards for excellence. Earlier this year, it was voted 'All-Cargo Airline of the Year’ at the 32nd annual Cargo Airline of the Year Awards, and has won the ‘Cargo Carrier of the Year on International and Domestic Routes’ award in the annual Wings of Russia ceremony for four consecutive years. In Europe, ABC also received the ‘Best Cargo Airline’ trophy in 2014 in the Golden Chariot awards. 2015 has also been another year of industry and customer recognition for Volga-Dnepr Airlines. It won the Air Cargo Industry Achievement Award in the World Air Cargo Awards presented in Munich, and was honoured with a special award to mark its ‘Contribution to the development of Russian air transport’ in the annual Wings of Russia Awards to recognise excellence in commercial air transport. Most recently, it was voted Best Cargo Charter Airline in the annual BACA Awards.